Hello everyone, I’m Maria Elisa from The Llamas blog! I’m back again to propose you a new free crochet pattern, made with Fettuccine yarn! 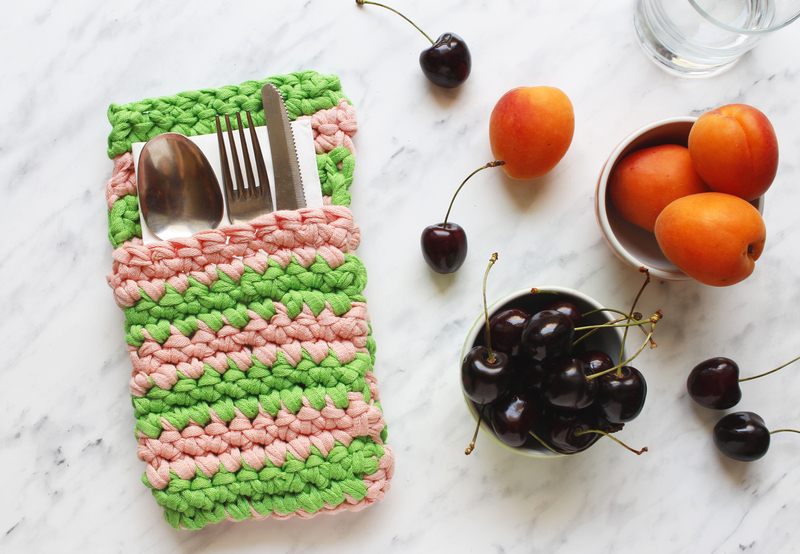 This time, the girls from Bettaknit and me thought we could offer you a very easy tutorial to make some practical and colorful striped cutlery holders, perfect for your outdoor dining with friends and family. During the summer there’s nothing better than spending the evenings “al fresco”! 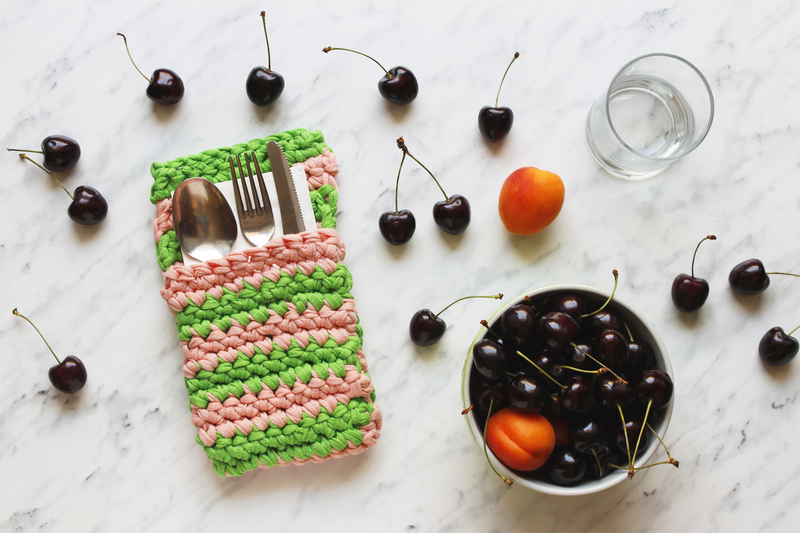 You can make these cutlery holders in a very short time, they are practical and colorful! 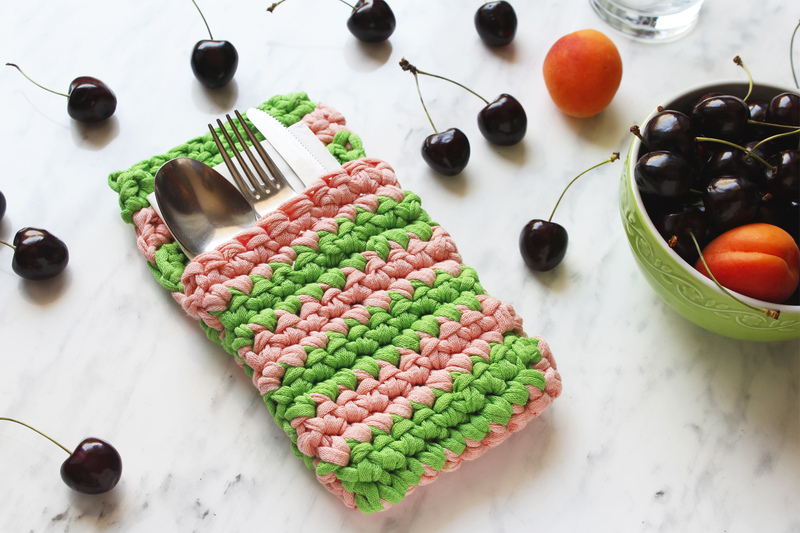 They are a good idea to use the left-over yarn and they will be perfect if you match them with the new home decor kits I designed for Bettaknit: Cactus Basket and Cactus Placemats. This combo will make your dinners with friends cheerful and informal… and in perfect home decor 2017 trend! Just remember to change color every two rows (when you are working the last double crochet). If you want to revise the double crochet technique this video may help you! Have you already subscribed at BettaKnit channel on YouTube? There are many video tutorials about basic crochet and knitting stitches. They are all very clear and well-made, perfect for beginners. Let’s move to the free pattern! 9 mm hook, you can find colorful ones by Bettaknit here! Foundation row – 11 ch with the first color. Row 1-2 – 1 dc in each stitch [10 dc], change color at the end of the row 2 (pic 1). Row 3-32 – 1 dc in each stitch around [10 dc]. change color every two rows. Leave the yarn tail pretty long. Hide the yarn in the work using a yarn needle. Fold the rectangle so that the bottom aligns with the base of the third row from the top (pic 2). Sew the three sides (right – bottom – left) with a running stitch, using the yarn needle (pic 3). Turn the cutlery holder inside out, passing the bottom through the pocket. Cutlery holders are ready! Easy peasy, right? There’s only friends missing, just go and call them! 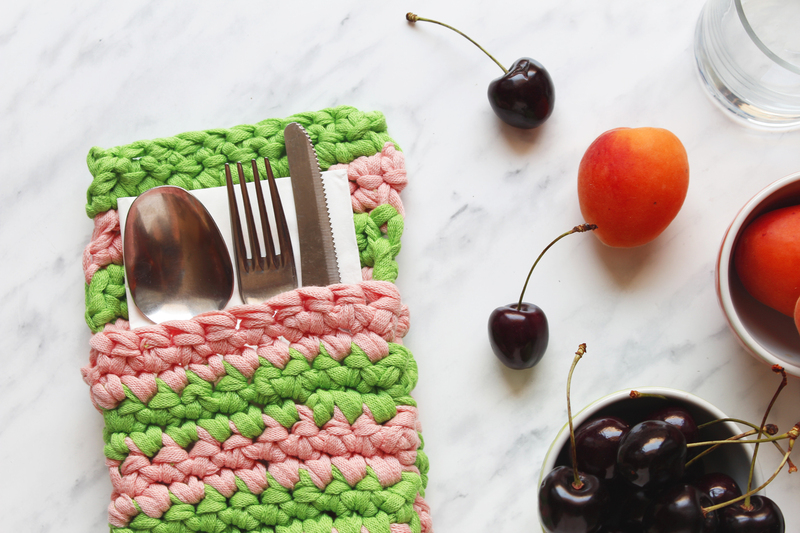 When you will share the pictures of your dinners al fresco on Facebook, Instagram e Twitter use the hashtags #thellamas #bettaknit #ilovebettaknit!